Letters to John: Please Stop Asking! I survived Christmas and New Year's Eve. Emotionally, I feel like I've been run over by a lawnmower. A mulching mower. On the lowest setting. I'm struggling to regain my emotional equilibrium. I've spent the last two weeks feeling depressed and desperate. There's no reason other than the holidays and a fibro flare. It will pass. Yesterday I took down the Christmas decorations; it's amazing how much that helps. 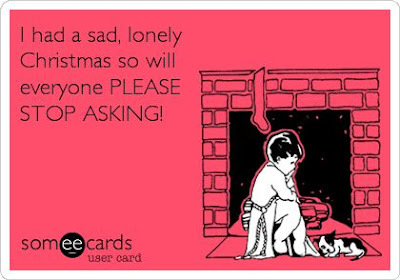 I'm longing for normal life - regular work schedule, regular food, no more Christmas music at work. Over the weekend I failed to think of anything I could look forward to. But today I realized that March Madness is coming. I am looking forward to the Pittsburgh-Cincinnati post-season football game, to the NCAA basketball tournament, and to spring training. I don't think I'll be able to afford to travel for vacation, so there's nothing there. But sports haven't failed me yet, so emotional health is on the horizon. Winter is finally upon us: It snowed last night, and tonight's low is supposed to be 9. Yesterday I put the flannel sheets on the bed - I do believe it's the latest it's ever been. And that was another source of depression. I remember how much we both enjoyed that first night every year with the flannel sheets, how we'd lie awake for a long time talking about how good they felt. We always looked forward to that first night; now I dread it because I do it alone. For the life of me, I can't get that animals excited about flannel sheets. I can't imagine why. This is all very disjointed, but so am I. To sum up: The holidays were awful; I'm beginning to feel better; I'll recover; none of this is surprising. I'm afraid I'm being normal again. It gets a bit less awful every year. I asked Connie when the holidays get good again, and she said never. I have modified my expectations - I now hope for somewhat less horrible holidays. All this could be remedied if you'd just come get me!